My first look at the Telementor came as a result of me placing a wanted advert in our local newspaper, where I advertised for a telescope. Of the few replies one was from a foreign sounding man who said he had a “Zeisstz for sale”. As I was very familiar with the products from the firm Leitz and also because of his accent I thought he said “Leitz”. I discussed a rough price over the telephone, and my wife and I drove to his property in the rural outskirts of my hometown. On meeting him, and viewing the telescope I discovered that it was in fact a Zeiss. This, while a minor letdown, was still a rare find. The deal was done and the three of us went home, my wife, my new “baby”, and me. This would have been in the early 1990s; I cannot remember the exact date, but around 1993. I am unsure of the first object I viewed through the Telementor, but my guess it was the moon, as it seems eminently suited to lunar viewing. While I had been used to fine photographic equipment I was very impressed with the robustness, and finish of the Zeiss. It was typical of the German build, and seemed to have a character of it’s own. My usual observing site, for the past four years anyway has been the backyard/driveway of my address in semi rural Auckland. This is the largest city in my country, New Zealand, and suffers from the usual large city ailments. Parking, people, pollution etc. I am fortunate to live on the extreme outskirts of this sprawling city, population 1.3 million. Around me is lush green grass, and horse paddocks. There is however the light pollution glow to my north, and what I term “runway lights” along the motorway nearby to the east. While not as good as other sites in the nearby vicinity it allows me the freedom to wander out and be alone with the heavens, and at a moments notice as well. Auckland suffers from poor seeing, and has it’s fair share of cloud cover, due to major oceans, the Pacific, and the Tasman Sea, a matter of 30 miles to the east and the west. Being at sea level certainly does not help either. Limiting magnitude would be around 4.5 – 5 at a rough guess. The Milky Way is very distinct, as are the Magellanic Clouds. I seem to be looking at more of the object suitable for the Zeiss lately, possibly as a result of having only the Zeiss for a short period. The moon is awesome, and I tend to look at this for perhaps three weeks of the month, and tackle the more elusive objects during the new moon week. I have fabricated a solar filter using the wonderful Baader Astrosolar Film, and the Zeiss is superb here as well. I have renewed my interest in finding and splitting double stars of late, and once again the Zeiss excels. Of limited benefit are the deep sky objects, but many globulars have been re-found with “only 63mm. Mars is also very topical at present. I feel the moon at or near first quarter is both the most beautiful and most incredible object with the Zeiss. I also get a charge each time I look at a close, but not impossible double. To see the minute blobs of light sometimes surrounded by concentric rings reinforces the obvious quality, and one that is missing from a large selection of commercially available modern day instruments. Perhaps the object with the most “wow” factor for others is Saturn, for the obvious reasons. My eyepieces at present are a set of the humble Zeiss Huygens type in focal lengths of H-40mm, H-25mm, and H-16mm. I have recently added a Zeiss ortho, an O-10mm. I hope to secure a selection of other Zeiss orthos. In addition I have secured a Zeiss zenith prism, and a Zeiss 2x Barlow. The Zeiss is mounted on the usual T Mount, and while not driven is a pleasure to use. The finish of the mount, and wooden tripod is in keeping with the OTA, absolutely beautiful. In the more recent years I have had a selection of Schmidt Cassegrain telescopes, notably a Meade 10”, a Celestron 8 inch, as well as a Russian Maksutov Cassegrain. I have also had brief flings with the well-known ETX 90mm. While obviously a mile away from the C8, and LX50 Meade, the Zeiss compares in similarity to the ETX. They are worlds apart. While the ETX is small, light, compact, and easily portable, the Zeiss is slightly less so. In my opinion the 63mm Zeiss is very close in light gathering, and resolvability to the 90mm ETX. At a recent gathering of our local astronomy club the Zeiss was viewed very favourably by all that looked through it, and on a deep sky object the Eta Carina nebula. The main reason for the success here was no doubt the very dark sky location. I am sure that the Zeiss gives as good if not better views compared to the ETX, and is not that far behind the Maksutov Cassegrain, which had a six-inch aperture. A similarity of the Maksutov was the dark velvety sky background, but with the limiting magnitude in the 6-inch obviously better that the 2-½ inch. I am sure that this question seems ridiculous to any Telementor owner. Let me state from the outset that I am ecstatic about my Zeiss. I have not always been so however. During the earlier days of my owning it, I felt that the small aperture was insufficient, and hankered for something larger. I put it up for sale on a few occasions, but fortunately nobody wanted to buy such a small, and hideously expensive telescope. Boy am I ever glad. In the pros and cons side of this essay, one thing that sticks out is that you either “love them or hate them”. When asked about perhaps purchasing a Zeiss I always tell people that if they do, then they had better be prepared to fall in love with them, as they are “infectious”. The small aperture is a definite con, but the quality of build and the appreciating asset are all pros. One only has to look at the premium prices being commanded by the Takahashi line of telescopes, even in the smaller sizes, albeit of fluorite design, to see that people will pay plenty for quality. As I said, “love em or hate em”. No other comments at this stage Luis, other than to congratulate you and the other stalwarts of the user group for such a wonderful web page. I have viewed it regularly, and am in the process of building up specific images for inclusion. It is nice to be able to communicate with others around the world with a common interest, or is that fascination? Also that it is well worth trying photography through the Telementor. 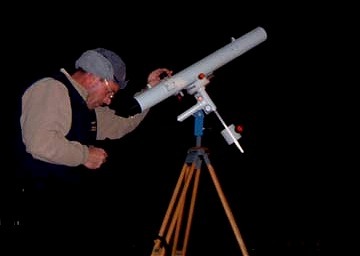 I have for most of time with the telescope attached a 35mm camera and used the Zeiss as a “840mm” tele lens. Of late I have attached a Leica digital camera to the rear of the eyepiece, and used the setup for eyepiece projection pictures. I urge those with even the slightest inclination to give it a go. If in doubt drop me a line, and I will do all I can to assist with the setup.